High response rates have traditionally been considered as one of the main indicators of survey quality. Obtaining high response rates is sometimes difficult and expensive, but clearly plays a beneficial role in terms of improving data quality. It is becoming increasingly clear, however, that simply boosting response to achieve a higher response rate will not in itself eradicate nonresponse bias. 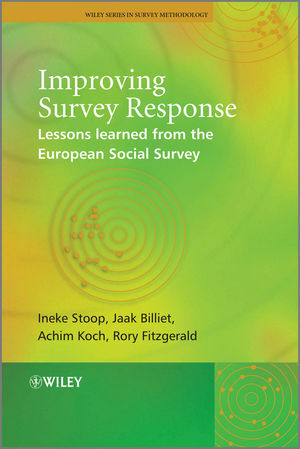 In this book the authors argue that high response rates should not be seen as a goal in themselves, but rather as part of an overall survey quality strategy based on random probability sampling and aimed at minimising nonresponse bias. A detailed coverage of nonresponse issues, including a unique examination of cross-national survey nonresponse processes and outcomes. A discussion of the potential causes of nonresponse and practical strategies to combat it. A detailed examination of the impact of nonresponse and of techniques for adjusting for it once it has occurred. Examples of best practices and experiments drawn from 25 European countries. Supplemented by the European Social Survey (ESS) websites, containing materials for the measurement and analysis of nonresponse based on detailed country-level response process datasets. The book is designed to help survey researchers and those commissioning surveys by explaining how to prioritise the reduction of nonresponse bias rather than focusing on increasing the overall response rate. It shows substantive researchers how nonresponse can impact on substantive outcomes. Head of the Department of Data Services and IT, Dr Stoop has worked in survey research and data quality for almost 30 years. She's a member of the advisory board for both Eurostat and the ISI. Her main research interest is nonresponse. Professor Billiet is head of the Centre of Sociological Research and a member of the central co-ordination team of the European Social Survey. Senior Researcher Achim Koch has been working in this area for 20 years. He was Director of the German General Social Survey between 1995 and 2004. Senior Research Fellow Rory Fitzgerald has had many years experience working in surveying. Before moving to his current post he was Research Director at the National Centre for Social Research (NatCen) for 5 years. All four authors have published numerous articles in this area. 3.2. What is the European Social Survey? 8.1. What is nonresponse bias?